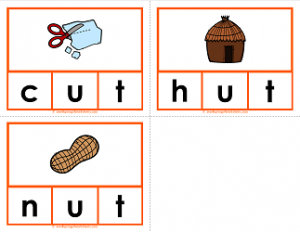 Thanks for visiting this page of -ut words clip cards. There are three words included in this cvc word set. They are: cut, hut, and nut. On the 12 pages included in this set you’ll find eight different mini sets of cards and three sets of letters, one in all black, one in black with the vowel in red, and one in all red. Check them out! I think you’ll like them.